Trichinella (Trichinella spiralis) most of its life in the gut, the other part - in the muscles of the host animal; accordingly distinguish two stages: the intestinal and muscle Trichinella. Masters Trichinella are various mammals (predators, even-toed ungulates, insectivores, rodents, pinnipeds), including the person to whom they are of particular disease - trichinosis. Infection of humans occurs mostly from pigs, at least - from wild animals. 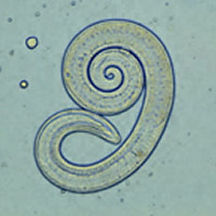 Considering the meat of pigs infected with Trichinella, it can be found scattered small oval cells - capsules containing twisted into a spiral of small worm (only 0.5 mm in length). This is the young "muscle Trichinella." In case Trichinella meat will be insufficiently sterilized, e.g. badly thoroughly boiled or bad well-done eaten host (human, pig, rat and so on), the last capsule dissolves in the stomach and young Trichinella out of them, intending in the small intestine. Quantity released to the human Trichinella can be enormous. In the small intestine grow and Trichinella three days give adult males and females. Copulation occurs, after which the fertilized females are attached to the head end of the mucosa. Trichinella is characterized ovoviviparity. During his life (and she lives about two months) to 2000 female hatch larvae. Young larvae penetrate lymphatic and then into the circulatory system. Bloodstream carries them to different parts of the body. Next own active movements of the larvae penetrate into the fibers of striated muscle, where they feed, grow and eventually destroy the fiber. Two weeks later Trichinella calm, curler and gradually surrounded by connective capsule. About a year after the formation of the capsule wall it is deposited calcium carbonate, causing the capsule takes a milky white color. Thus, the entire life cycle of Trichinella passes inside the host organism without going into the environment. 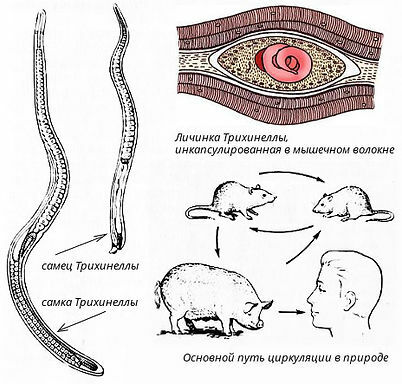 In the intestine of the host developing mature worms, and at this stage it is final, when the parasite larvae penetrate the muscle, the same individual becomes the intermediate host. This scheme lifecycle Trichinella with a sharp decrease resistance of the host organism can be modified. Hatch the larvae of the parasite, infiltrating the intestinal villi, do not follow later in the blood vessels and quickly to complete the development of the site and back into the lumen of the intestine, where they reach maturity. This results, on the one hand, to increase the number of multiple Trichinella in the gut and intestinal infestation extends, and on the other hand, causes an increase in muscle infection. A person infected with Trichinella from pigs, but this is just the way the blind side and their distribution, as falling within human Trichinella doomed eventually to death. Pigs infected by eating dead rats, or the dregs of pork from abattoirs and infected rats, devouring the fallen colleagues from trichinosis. 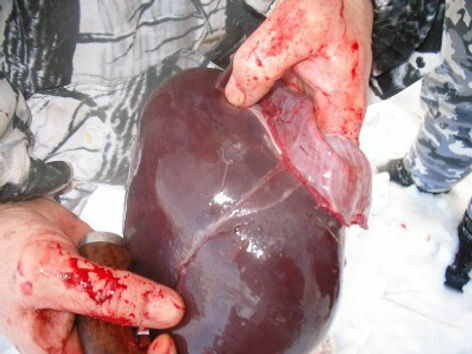 Symptoms of trichinosis are shown, starting with the introduction of females in the intestinal wall, gastrointestinal disorders, and facial swelling. Shortly after the disease starts chilling, and then the temperature rises, sometimes up to 40 * C and above. There was also a headache, body aches, feeling of weakness and probing different muscles more or less severe pain in them, especially when chewing, swallowing, turning the eyes. The disease can last up to six months, and in cases of severe infection can cause death. As a preventive measure against trichinosis inspection of pig carcasses is carried out, going on sale by examination under a microscope pieces of muscle. Trichinous carcasses destroyed. It is necessary to observe cleanliness in the pig, make sure they do not eat dead rats or other residues from the slaughter of pigs.